To whomever looked at rice, tomatoes, peas, shrimp and chicken and thought “Eureka! Throw it all in a pan, put the top on and cook it all at once! It’ll be killer!”, I tip my hat to you sir-or-ma’am. I mean, who would have thought that you could make such a perfect, nutritious, substantial, leftover-friendly meal by literally throwing stuff together in a pan* and letting it, essentially, cook itself into a comforting meal that can warm you up even on the most single-digit of days? The Spaniards, that’s who. But, in true UN-worthy cross-cultural cooperation, leave it to the Italians to improve it. Wait, let me back up. You see, I’m not entirely sure what kind of rice is traditionally used by Spanish grandmothers and other authentic-Paella-makers, but I am here to tell you that arborio rice – yes, that very starchy variety with the plump and tender little grains that create the delicious foundation of a perfectly cooked, warm and comforting Italian meal – makes the perfect base for this easy dinner. If you’re sitting here side eyeing this post because where have you heard of arborio rice before?? it’s because it is probably more commonly known as “risotto rice” (ooohhh yeeeeeaaaah…) but it’s given name, if you will, is arborio. And Village Harvest‘s arborio rice is the perfect jumping off point to build this killer one pan meal. It’s worth noting the brand of the rice because not all rice is created equally, and you already know I am really limited in the volume and variety of grains that I can eat, so when I do eat grains, I make sure to choose the best I can find. 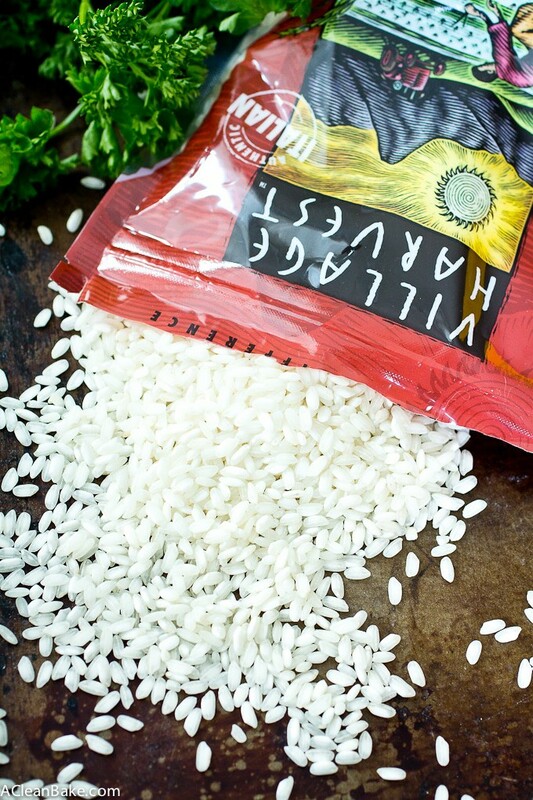 Village Harvest’s arborio rice is the highest quality available; it is natural and unprocessed, “superfino” (superior) grade and sourced directly from the Po River Valley in Italy. 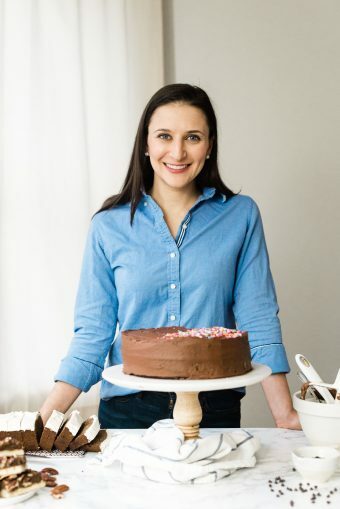 All this means that, if you’re eating grains as part of your healthy diet, Village Harvest products make it easy to stay on track with exciting, versatile recipes. With plentiful antioxidants, fiber and vitamins, Village Harvest offers varieties that satisfy your desire to explore new flavors and dishes in a healthy way. Not only do they offer top quality products, but Village Harvest also does a lot to improve the communities that they operate in, from the farmers growing the rice to the schools that the farmers’ children attend. So, supporting a company that makes the world a better place with every purchase, while enjoying a healthy, hearty winter meal? Talk about having your paella and eating it too. *A brief aside on the staggeringly compelling (but, here, relevant) subject of pans: Paella, the dish, is named for the Spanish word for pan, generally, not specifically a paella pan. If you have a paella pan, great! Here’s a chance to put it to good use. I don’t have a paella pan, but used this three quart stainless steel saute pan worked great for this recipe. Any heavy-bottomed pan with high-ish sides will work, as long as it has a top. Also, while we’re on the subject of expensive tools and ingredients, this recipe calls for saffron, which is one of the most expensive ingredients known to man short of, maybe, edible gold leaf. But it’s up there. It only calls for a few threads, which will not break the bank, but if you don’t have it on hand and don’t want to spend the money, just skip it. 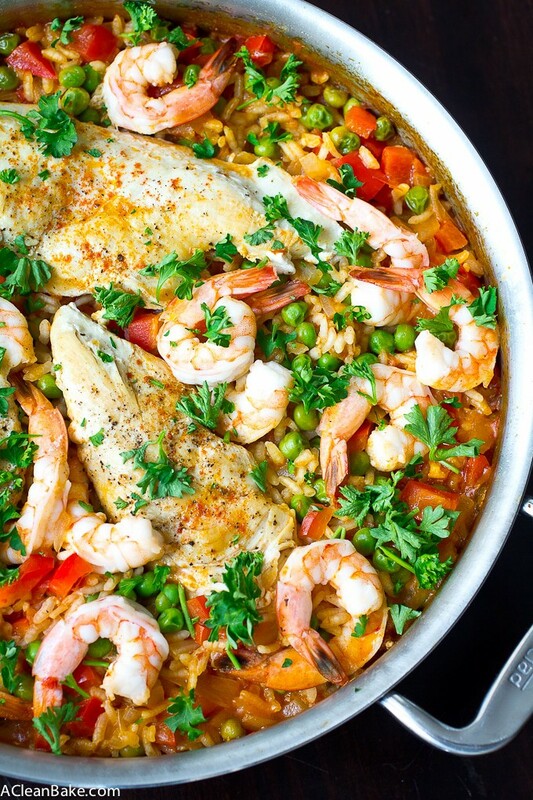 30 Minutes & one pan is all it takes to make paella for dinner tonight! You don't even need a special pan. It's gluten free, too! In a small bowl, whisk together 1/4 teaspoon each of salt, pepper and paprika. Set aside. In a large, heavy bottom skillet with high sides and a top, heat 3 Tablespoons olive oil. Add chicken breasts (or thighs) and season with half of the salt/pepper/paprika mixture. Once the chicken starts to get a little bit of color on the underside, flip and season with the remaining salt/pepper/paprika mixture and cook until it gets a little bit of color on the other side. It should not be cooked all the way through. Transfer the chicken from a pan to a plate and set aside. Heat the remaining 2 Tablespoons of oil in the pan. Add the onions and saute until translucent, then add the garlic and fry for about a minute. Add the Village Harvest Arborio rice and saute for about 30 seconds until the grains of rice become pearly (slightly shiny), then stir in crushed tomatoes, water or stock, lemon juice, remaining 1/4 teaspoon black pepper, saffron and remaining 1/2 teaspoon paprika. Cover the pan and cook until the rice has absorbed about half of the liquid, about 15-20 minutes. Do not stir! Add the peas and red pepper and gently fold them into the top layer of rice. Try not to disturb the rice at the bottom of the pan. 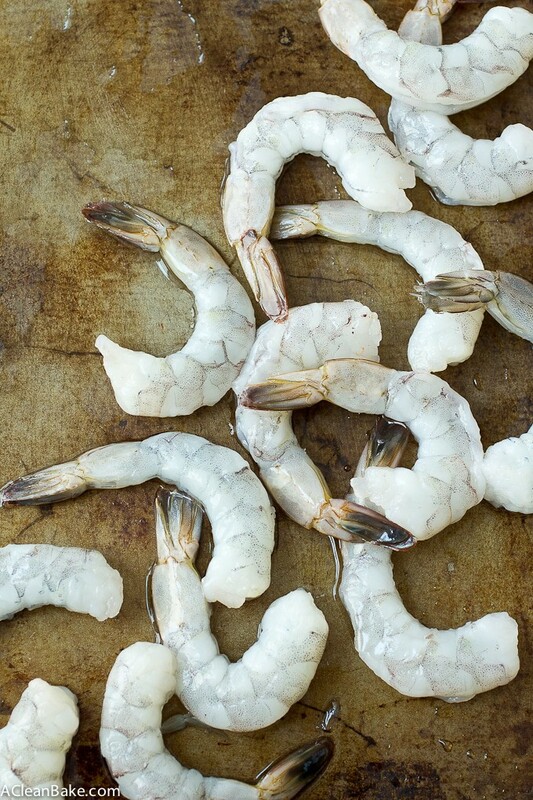 Place shrimp and chicken across the top of the rice and vegetables, sprinkle with one more pinch each of salt and pepper, and replace the cover. Cook about 10 minutes until the chicken has cooked through and the shrimp has turned pink and begun to curl up. 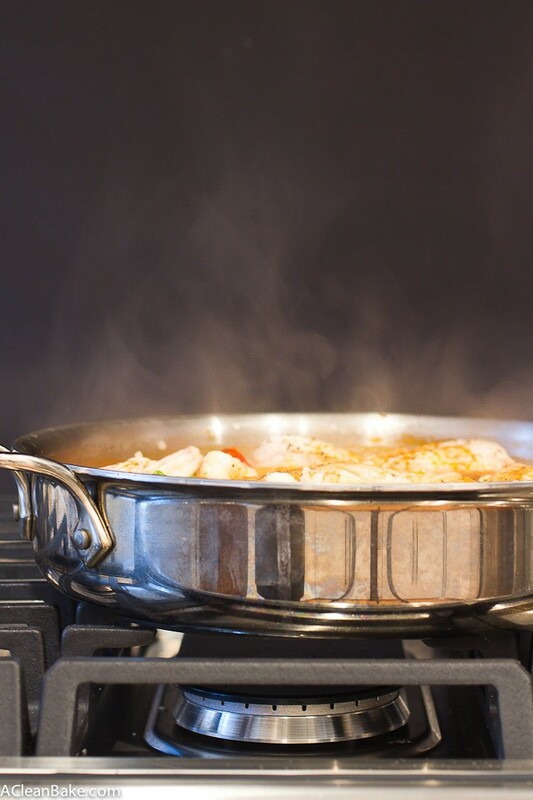 Then, without removing the cover, turn off the flame and allow the remaining liquid and steam to finish cooking the dish. Check it after 5-10 minutes. You'll know it is done when the rice is tender, but not mushy. It should still have a very slight bite to it. Taste and adjust seasonings (I like to finish it with another splash of fresh lemon juice from 1-2 lemon wedges), garnish with fresh parsley and serve immediately. I like Meyer lemons because they are not as sour, but if you are using a more sour type of lemon, decrease the lemon juice to about 2 Tablespoons, or to taste. If you don't have chicken or seafood stock handy, you can use water instead. However, you'll want to add another 1/4 teaspoon of salt to the pan along with the water. Makes about 4 generous servings. I love when dinners are one pot, makes life so much easier when you have a small kitchen! 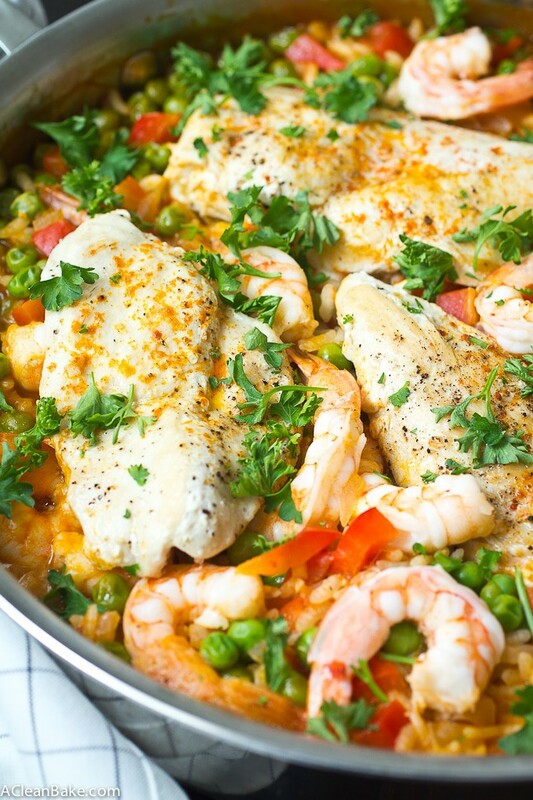 I am a huge fan of paella, such a hearty and tasty meal! Great recipe! That’s a GREAT point: lots of food with minimal dishes is such a great benefit when you don’t have a ton of space to work in! Yes!!! 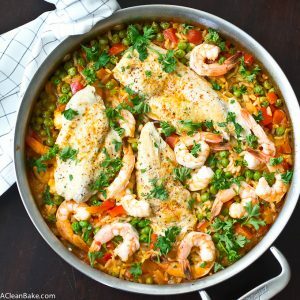 I love paella but have never made it myself. This looks gorgeous and I can’t wait to try it! You HAVE to try this, Becky, seriously. It is so easy! Such a lovely dish Nora. You are making me wonder why I never cook paella myself. It has all the makings of the things I like in a dinner. . .proteins, veggies, spice, & broth. And can I say. . .the colors are outstanding. What a stunning post! We’re in awe of your work here at Clever Girls! This looks so good, but I try to eat paleo as much as possible. Any way to paleo-fy this? Could I sub green peppers for the peas? What about the rice? I could make a batch of cauli-rice on the side, but how would I change the cooking time for the rest of the paleo-friendly ingredients. Thanks for the new recipe! Oh and also, if you feel like you might need something more to make this stick to your ribs without rice, you can also add chorizo! Hi, what do you mean by large red pepper “stem”? Is it just a large red bell pepper? There is a missing comma. It’s supposed to say “large red pepper, stem, seeds and membrane discarded. As in – remove and discard the stem, seeds and membranes and use just the red part. Sorry about that! Hi Nora!! I just love your site! I’ve made this before and it was delicious! I’m thinking of making it for our Christmas Eve dinner with an addition: sausage. Do you think I could add sausage to this recipe? If so, would I have to alter anything else? Thanks! So I absolutely love this recipe and want to make it tonight-however, the one ingredient I don’t have is chicken breasts. Do you think it will make a noticeable difference in flavor if I omit them altogether? Or should I add more shrimp? Hi! No I don’t think it will ruin the recipe at all. 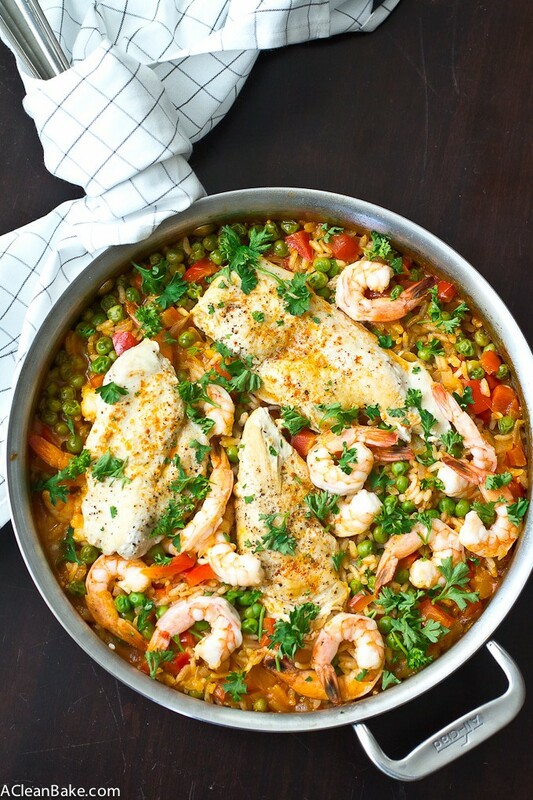 Paella is SUPER adaptable and you can feel free to use more shrimp in place of the chicken, or you can use another cut of chicken (thighs are good!) or kind of fish (cod fillets work great!) in place of the chicken. Enjoy!